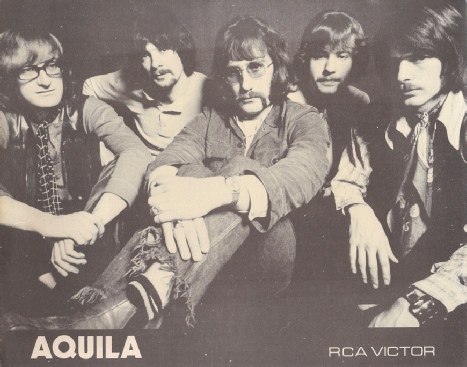 When Aquila died, part of me died with it, as my life and soul was immersed in this band. Sincerest thanks to the other band members: James Smith, Ralph Denyer, Phil Childs and George Lee for the greatest of all times and for sharing the experience. I wish you all the very best! 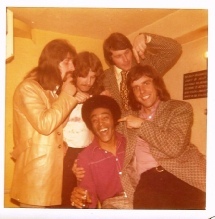 In 1969 James Smith and I (Martin Woodward) were working with the Fantastics in the UK and Europe. During our time in Germany, France and Majorca Aquila was talked about and planned. On returning to the UK we introduced Phil on bass who James new previously. Ralph then came along as a result of an advert in the Melody Maker. We then auditioned for a sax player and were lucky enough to find George. After initial rehearsals, we went out to Rome and worked in the Piper Club for about a month where we started work on the makings of our album, which was cut the following year (1970) for RCA. Read more about Aquila HERE. 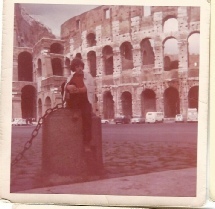 This is me outside the Colosseum in 1969. After all that time you think they would have fixed it by now, but no, nearly 50 years on and it’s still in ruins! This is me with the Tommy Hunt band after Aquila. We also performed and recorded with Emile Ford.